Help! Help! Someone call Rorschach, someone is killing capes!! 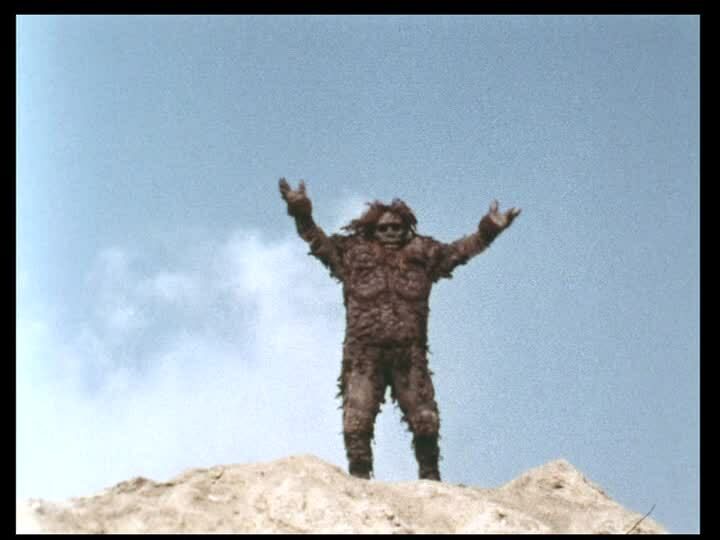 Sanda is the brown Gargantua seen in The War of the Gargantuas. In the film he is heroic, so of course the blood-lusting Godman wants his head on a platter! 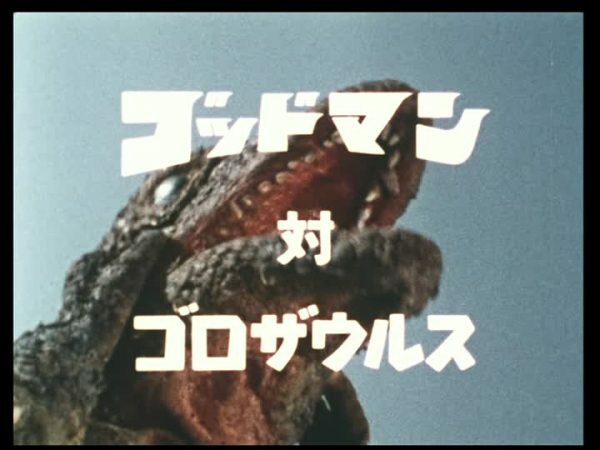 March of Godzilla: Godman again presents another episode of Godman’s bloodbath across the world of Toho kaiju, as he slowly slaughters everyone and anyone he comes across. 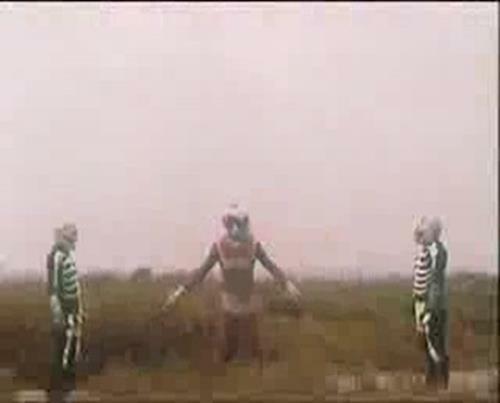 The Sanda suit has seen better days, it’s half-rotted, but still together enough for Godman to kill Sanda without too many children losing interest and switching the channel to whatever was airing opposite this in 1973. 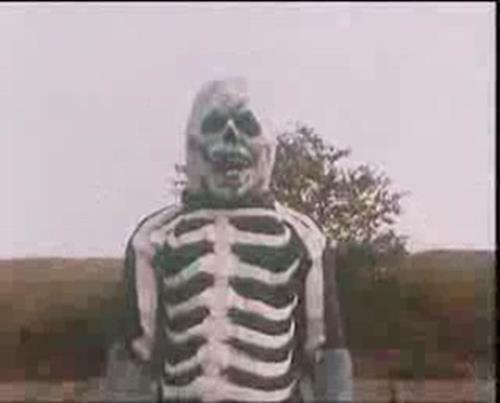 The DVD has only the fifth episode of Godman’s battle against this Gargantua. It begins with Godman punching Sanda around a bit. 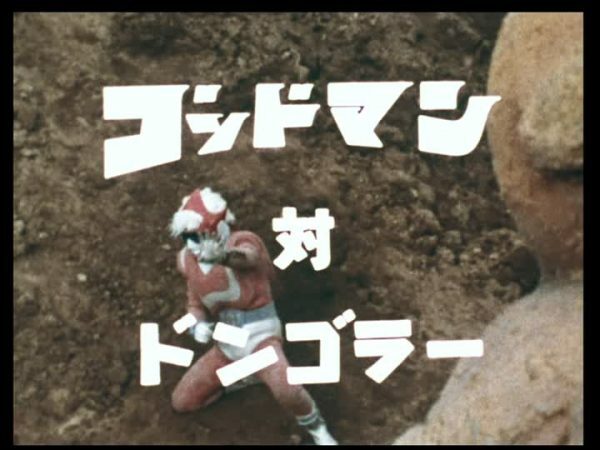 Sanda runs to the city, and Godman picks him up and spins around, then tosses Sanda down and punches him a lot. Sanda gets up from this pummeling and beats his chest in defiance like he’s King Kong. Totally wrong monster, director! 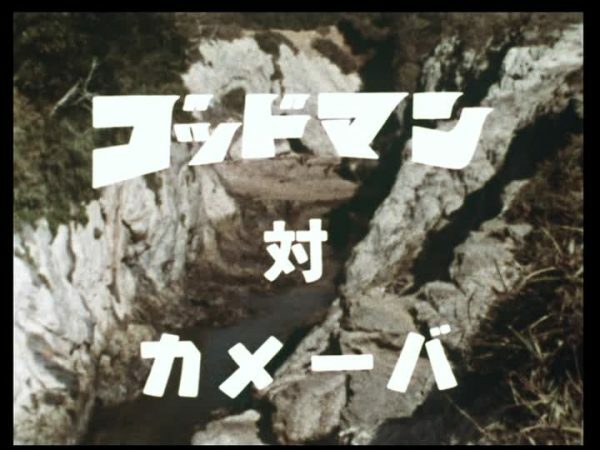 Godman takes the taunt and jumps on a cliff and fires missiles at Sanda, but Sanda continues beating his chest to show Godman that he isn’t as cool as he thinks he is. No one owns Sanda but Sanda. I’m not sure how Godman can justify this at all! Godman continues his killing spree, this time setting his sights on Dongolar. What crimes Dongolar committed, if any, will remain unknown as only the fourth of six episodes were on the DVD set. For more info on Godman, be sure to drop by the Godman Splash Page! Godman is hurting as we join this series, already in progress. He’s still small while the giant Dongolar lords over him. But a kid throws him a frisbee with one of his golden shoe rings, the lack of which was preventing Godman from growing to large size. Maybe keeping track of those things would be important? 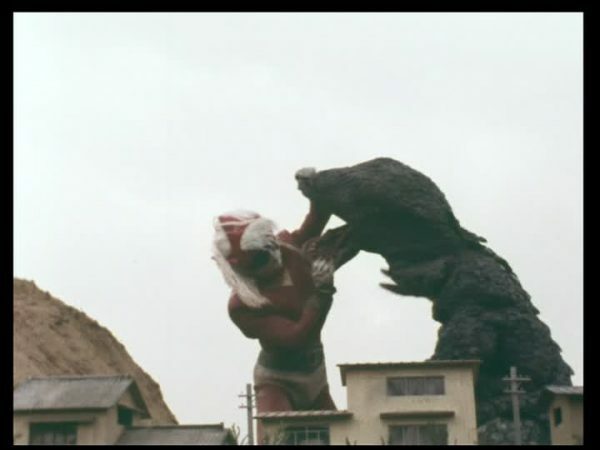 I’m no expert in kaiju fighting, except for the fact that I am. Godman grows big, Dongolar helpfully falling down so he can be more easily beaten up. It’s like Dongolar wants to lose or something. They roll around in the sand together, their physical activity looking more like lovers embracing than enemies grappling to the death. Seriously, this show is the most sexual of monster shows. Luckily we tsuzuku away before things get X-rated! March of Godzilla 2015 will return with more Godman, because his crimes must be exposed to a new generation! Godman continues to work his way through all the suits Toho had lying around, and some new suits that were made out of what Toho found at the Goodwill store. March of Godzilla: Godman is proud to present this brief synopsis of the one episode of this story arc that made it to DVD! This week, Godman fights a classic Toho creature, Kamoebas (aka Kameba), from Space Amoeba. Godman also fights Folgon, but he’s just a monster Toho made up for the show, and isn’t even in this episode on the DVD. But we’re all about going above and beyond, so we’ve tracked down this entire story arc to present to you, the people who won’t be reading it and will just look at the photos! If you need a Godman primer, feel free to stop by the Godman Splash Page! Kamoebas is a turtle, and he does what turtles do, which is stand still and use their shell for defense. 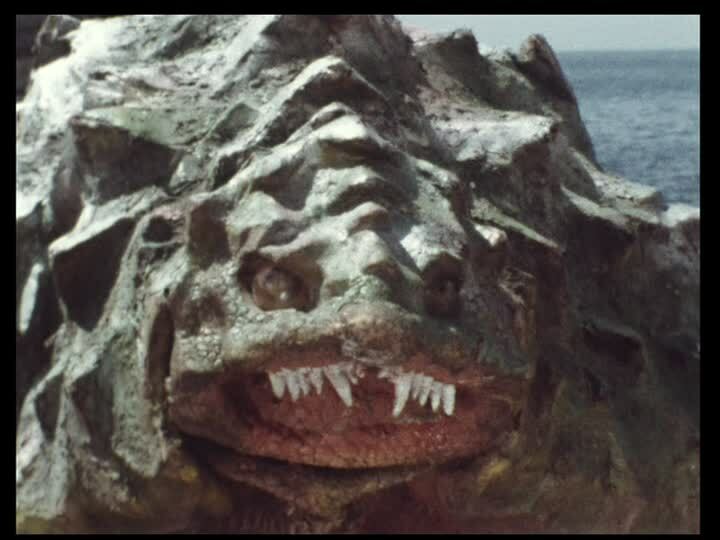 A old couple sees a monster at the beach – it’s Kamoebas! GODMAAAN!!! Beep beep, back the truck up! Why is Godman being called…by old people? It’s demonstrated in every other episode that children call Godman, there is even an episode where the adults have to have the children call for Godman! So why do these old people get to call Godman? Is there a larger definition of the Godman worshipers beyond children? Is it the children and the elderly? Because I could see that happening. Two groups on extreme ages, working together to call a fighting man from the sky. It’s just weird enough to keep you up at night. Godman creeps over and sees Kamoebas is just standing there, minding his own business, so Godman bravely attacks! Kamoebas just stands there. Godman totally punches first. Also second! Then he almost falls over. Godman feels this is somehow an attack by Kamoebas, so now he feels justified in self-defense. It’s interesting to see Godman was the guy who wrote the stand your ground laws. 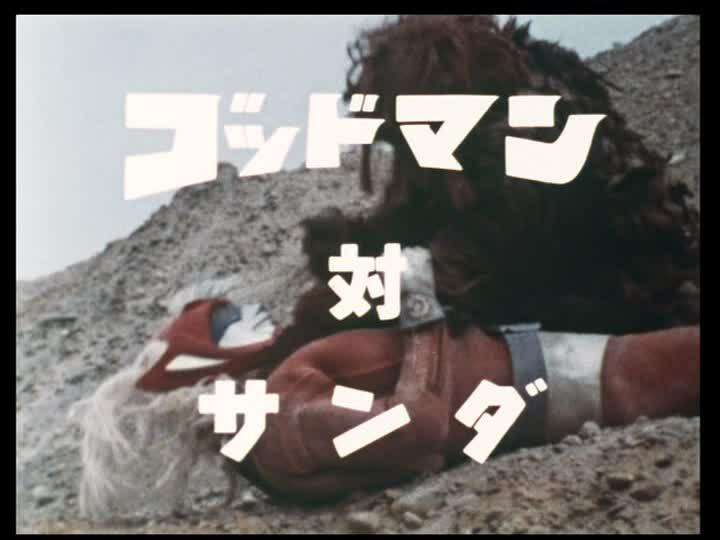 Godman fights and fights Kamoebas, who barely seems to notice as Godman hurts himself on Kamoebas’ shell. 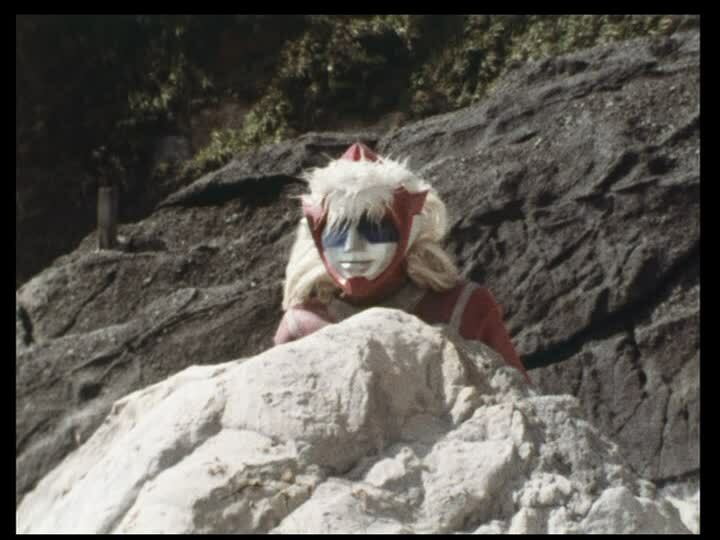 Godman stares at Kamoebas as the episodes jumps to tsuzuku. Now that’s a darn weird ending. 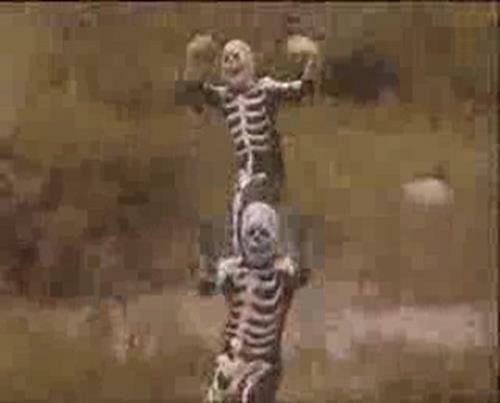 But as Folgon is another monster Godman fights that week, maybe Folgon is behind Kamoebas standing still on the shore. This mystery would have had to remain until the rest of the show was located had I just used the one episode on the DVD…. So we jump into episode 2, and Godman is preparing to make turtle soup out of poor Kamoebas. He hugs Kamoebas and they spin around a bit like they are dancing then soon he is throwing ineffective punches and kicks. Godman pulls out his Godmail Flail, and tries to strangle Kamoebas with it! That’s not how flails work, guy! Godman punches Kamoebas in the back a bit more, then knocks him onto his back and spins him around and around and around and around, then uses his wrist guns to blast Kamoebas in the belly with bullets. Kamoebas slinks back into the sea, regretting getting out of bed and sunning himself on a nice warm rock that morning. Brave Godman, savagely beating up a monster who did nothing, is declaring victory and shouting like a loon. But another monster is there! He’s like “I’m the real villain, you idiot!” Thus we tsuzuku into… Godman vs. Folgon!!! Why are you murdering me? I’m just looking for the hospital! Oh, God, NOOOOO!! Hell yeah, Gorosaurus is back! But he’s getting beaten up by Godman, because Godman is a jerk and kills everything you love. Especially if what you love is ratty old kaiju film costumes like this Gorosaurus suit, which has seen better days by far. The Gorosaurus suit is in such bad condition that pieces of it are flopping around and it’s all crushed inward like all the padding is missing or decayed away. In fact, it’s hard to think anything except Gorosaurus is very very sick and shouldn’t be getting beaten up by this jerk Godman, but should instead be given medical attention for whatever illness is happening to him. Someone call up Medical Jet Jaguar, I don’t care if he hasn’t been invented yet, go get a time machine and then go get Medical Jet Jaguar! We need an intervention to save Gorosaurus before Godman the jerk kills him! 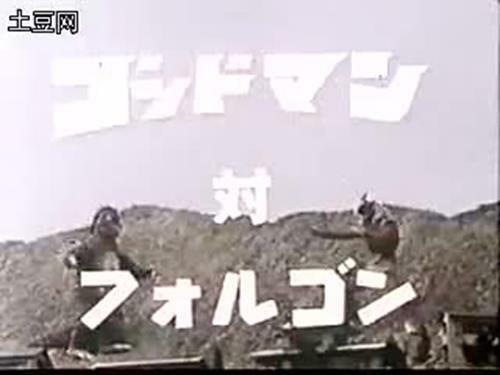 The only episode that made it to DVD is the final episode, number 6, which consists of Godman beating the ill Gorosaurus up for a while before tossing explosive disks at him. Godman follows this up by firing his Godman Supersonic Wave, blowing up Gorosaurus with swirly death!! 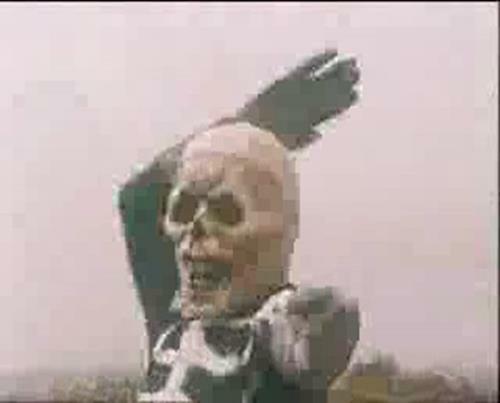 BOOOOOO!!!!!!!!! 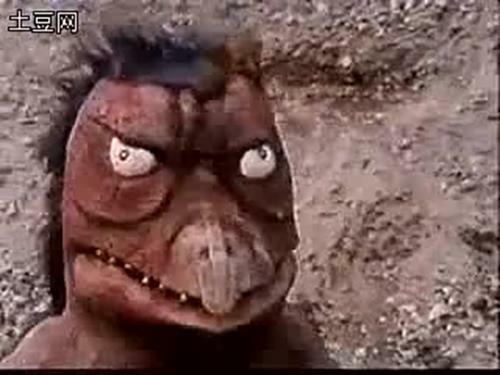 Gorosaurus never did anything to you, except live and get in the way of your fists. Godman should have been escorting Gorosaurus to hospice care to help with his obvious disease. Way to be a horrible monster, Godman. Someone needs to call Godman to kill Godman. 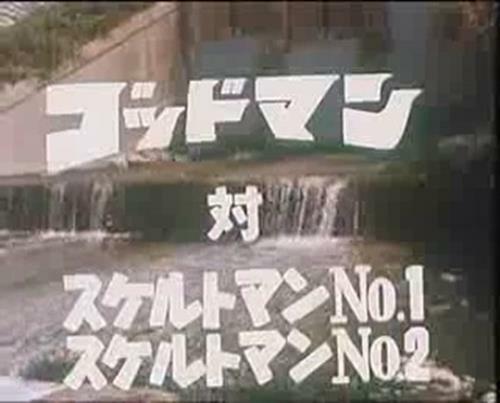 There are a few clips of earlier episodes online, which consist of Gorosaurus stomping around the nearby town, expertly not stepping on any building, almost as if he’s avoiding wanton destruction because he’s a good guy (Or more likely, the tv series doesn’t have the budget to break the models!) This makes it even more sad when Godman kills him. I am not sure what episode the clips are from, as they begin in the middle of the show. March of Godzilla: Godman will continue, and check out the Godman Splash Page for more Godman goodies!